University social science and humanities researchers have explored many aspects of American Indian culture. One of the first and most important studies of Cherokee life was by John Gulick, an anthropologist at the Institute for Research in Social Science, who won a grant from the Ford Foundation. 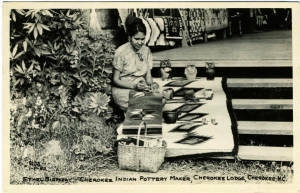 Based on field research done in western North Carolina from 1956 to 1958, Gulick and his students published studies on the Cherokee family, work, and the tribe’s relationship with Indian tradition.